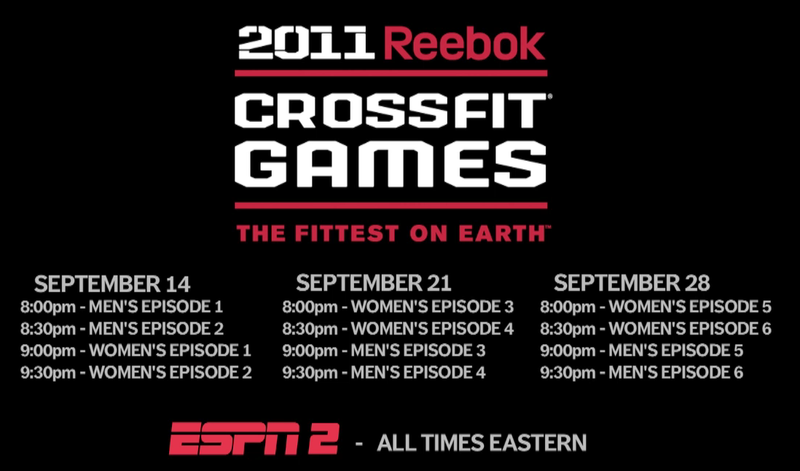 Last night the 2011 Reebok CrossFit Games were featured during Prime time on ESPN2 (a Major Cable network!). For MANY of you, it may have been the first exposure you ever had to our sport of CrossFit. To avid CrossFitters, it was certainly the most “mainstream” exposure we’ve ever seen given to our sport. Regardless of your stance and experience with it, what are your thoughts? Did you like learning about CrossFit and the CrossFit Games? If you knew about them already, do you think the shows last night did them justice? I’m curious to how you all feel about it. All I know is that I was like a kid in a candy store watching some of my friends and other CrossFit starts tear it up! I’m a very active CrossFitter and a trainer at CrossFit Lakewood here in Denver, Colorado, so seeing my hobby and passion being presented to such a large audience actually filled me with a HUGE sense of pride! If you missed the shows last night, fear not, there are two more weeks of coverage on Wednesday nights! Check the trailer for the show below, and the TV schedule below that. So…. what’d you guys think?! They cover as many different lifestyle topics as you can imagine, and I have a feeling that this article is going to reach a much larger demographic through its posting. Also, it’s written from the perspective of a relatively new CrossFitter, so many of “our” concepts, terms and thought processes are actually written so the “Non-CFers” out there can understand. I’ve shared a few parts of the article below, but go ahead and click here or at the bottom of this post to view the entire piece. ~During my four-month experiment with the growing exercise brand, I learned that CrossFit proposes that elite athleticism and seemingly impossible workouts can be survived with a little help from supportive peers pushing each other through the pain. Group workouts pack the most functional movements of olympic lifting, gymnastics, and calisthenics into a 10-20 minute sprint. The routines are slowly creeping their way into the regiments of all-star athletes and armed forces divisions around the world. They’ve put me in the best shape of my life. ~”I think CrossFit can be for everyone,” says Val Voboril (who is … 9 months pregnant). “It made my pregnancy easier,” she contends, as the “strength, conditioning, and endurance,” helped her deal with the added weight of carrying another human being. At CrossFit, however, men aren’t always the alpha dogs, such as 106-pound Ting Wang, who deadlifts nearly 3x her body weight in the video below (I still can’t deadlift double my own weight). Here’s how the author, Greg Ferenstein, closes out his post. I would say it’s not too hard to agree with him with at least the statement below. The next 12 months will be very interesting for the future of the “Official” CrossFit movement. The strength of CrossFit’s market-oriented approach may also be its biggest challenge. Since workouts and individual culture are largely decided by independently owned gyms, CrossFit can only maintain a level of quality to the extent that trainers buy into the core philosophy and execute smart business practices. Moreover, since Glassman can’t patent “functional, high-intensity movements,” there’s nothing to prevent a Gold’s Gym or military division from wholesale adopting CrossFit’s basic approach without renumeration or giving credit. Ultimately, the survival of the official brand will depend on Glassman’s ability to maintain its community as the exercise program swells.